Breed Group: Hounds Height: 27-30 inches Color(s): immaterial (includes black, gray, red, fawn, either solid or brindled, either whole colored or spotted) Coat: The Greyhound has a very short coat that does not require much grooming. The hair of this breed should be glossy, but not silky nor soft. It should be very firm and harsh to the touch, and also coarse. The hair should be close lying and tight. The coat of this breed is somewhat weather resistant so baths should be sparse. The coat of the Greyhound should remain smooth. Distinct feature: The Greyhound is very gentle and sensitive, and makes a wonderful companion to most children. This is also a very talented breed and does well in a number of sports including hunting, sighting, watchdogging, racing, and agility. The Greyhound is an extremely graceful dog that is petite, making him an exceptional running companion. This breed does very well in a home environment, but can also do well in kennel life, although he does crave human attention and desperately wants to be part of the family. 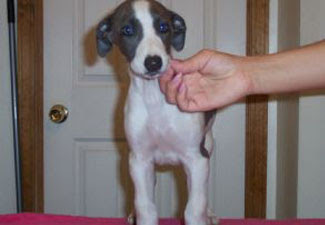 Temperament: The Greyhound is an affectionate breed that loves to be around his family, including children. They make a wonderful family pet, however they do have a prey instinct and should not be in a home with smaller animals such as birds, cats, rabbits, or something of the sort. The Greyhound does extremely well with other dogs, however they get along best with their own kind and do very well with another Greyhound in the home. This breed does get along well with children but because he is so sensitive, this breed would do best in a home with older and more respectable children. Activity: The Greyhound loves to run and needs quite a bit of exercise on a daily basis. A fenced in yard is a must, and it should be at least of average size. Long walks are also necessary to keep this dog healthy and active. The Greyhound has the tendency to chase things because of his strong prey instinct, so he should always be kept on lead or in a safe and fenced in area or he will be sure to run off when he gets the chance. This breed should always have at least 2 hours of daily exercise per day, as he is very agile and fast. Large Dog Breed Bull Mastiff .. English Mastiff ..French Mastiff.. Neopolitan Mastiff ..Great Dane.. St.BernardMedium Dog BreedAustralian Sheperd ..Beauceron..Belgium Shepherd.. Boxer..Chow Chow..Dalmatian..Dobermann.. German Shepherd..Golden Retriever..Grey Hound..Irish Setter..Labrador Retriever.. New foundland..Pointer.. Rajyapalam..Rottweiler.. Rough Coolie..Siberian Husky..SMALL DOG BREED Basset Hound..Beagle.. Bichon Fries..Bull Dog – English ..FrenchBull Terrier.. Chihuahua..Cocker Spaniel..Dachshund..Jack RusselTerrier..Lhasa Apso..Maltese.. Miniature Pinscher.. Pekingese..Pit Bullterrier..Pomeranian..Poodle..Pug..Samoyed..Scottish Terrier..Shih-Tzu..Tibetan Spaniel..Yorkshire Terrier..